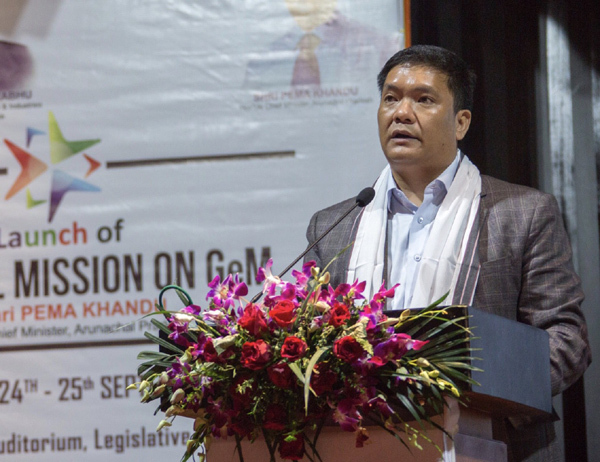 Chief Minister Pema Khandu on Monday launched the nation wide mission for promotion of Government e Marketplace (GeM) at Dorjee Khandu Auditorium in Legislative Assembly complex. It is aimed at bringing in more transparency and streamlining the government procurement. Speaking on the occasion, the Chief Minister said the objective of the launch is to accelerate the adoption and use of GeM by State Government and their agencies. He said Arunachal is the sixth state in India to have signed MoUs with GeM, which aims to bring in transparency, efficiency and inclusiveness in public procurement and achieve cashless, contactless and paperless transaction. He said the national drive from 6th September to 15th October is aimed at creating awareness about GeM, train the buyers and sellers, get them registered in GeM and increase the procurement through GeM. Khandu said more than 26,000 govt agencies have been incorporated in GeM including above 1 lakh onboard with more than Rs 10,500 crore transactions having taken place so far in the country, which is a big achievement. Khandu said the state government has adopted zero tolerance towards corruption and the launch of GeM and the recent reforms in recruitment process is aimed at achieving that. He said government offices in Arunachal are plagued by corruption mainly in recruitment and procurement process, which diverts enormous amount of the department’s time and effort from its core activities. It also took a toll on health of the employees, as they have to face immense pressure from powerful lobby for giving away undue advantage to them. With adoption of Arunachal Pradesh Staff Selection Board and GeM, the officers and employees of the government departments will be relieved from recruitment and procurement activity taking away excessive work pressure from them, said Khandu. The Chief Minister said the objective of the reform is to provide a happy and healthy life to its citizens. He said several reforms aimed at ensuring efficiency and transparency under digital Arunachal programme such as launch of e-office, CM dashboard, e-ILP, e-cabinet in the last two years has been initiated. He further said the Ministry of Commerce has rolled out State export strategy for creating export infrastructure with 80% subsidy for Northeastern states, which will benefit the farmers in the state. He also said to improve digital connectivity in the state the work on Rs 1700 crore project sanctioned by Ministry of Communication is already underway. Earlier Joint Secretary of Dept of Commerce, GOI, Shyamal Mishra and Chief Secretary Satya Gopal also spoke.